The handheld ECG device is an affordable and accessible diagnostic tool for identifying cardiac abnormal conditions by recording the electrical activity of the heart. In February 2013 Cardea Associates released its new Handheld ECG device, the CardeaScreen. This device was specifically designed for young athletes; being in-sync with the normal functioning of a young athlete’s heart from age 14 and up, and being suitable for use before participation in sports events. Cardiac arrest is the leading cause for sudden death during sports activity, due to medical reasons. Often a preexisting heart condition is not known, and this is the first indicating symptom, being at this time already too late. Having an affordable and accessible device enables high schools and colleges to own an ECG and be able to examine their athletes thereby lowering the number of cardiac arrest cases. 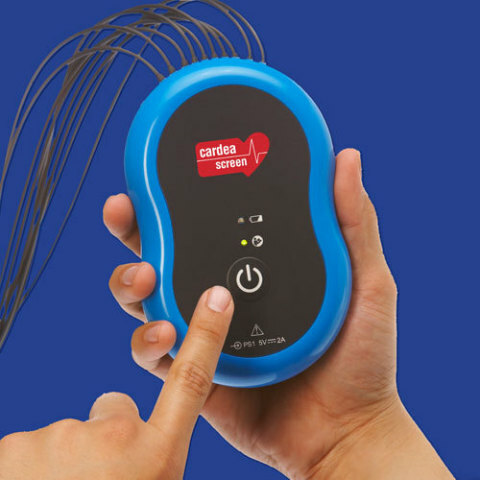 An important feature of the CardeaScreen is the fact that being specifically designed for athletes, it produces many less false-positive-results by producing more accurate results than other handheld ECG devices. A false-positive-result may cause an athlete not to participate in an event and go through unnecessary examinations therefore its elimination is a time and money saver. The FDA cleared CardeaScreen medical device transfers the information to a standard PC via Bluetooth and assists physicians in identifying in advance an abnormal condition. An additional recent release in the handheld ECG monitor market is the imPulse, designed by Plessey. This is a new application for their non-contact semiconductor sensor technology. The device records ECG signals with direct skin contact by placing the thumbs on two sensor pads, with no need for a gel or any skin preparation. The signals from the device are transmitted via Bluetooth to a smart phone. A special software application displays the information and can provide simple analysis of pulse rate and pulse variation. The device was first displayed in November 2012 in the Electronica exhibition in Munich. Having an affordable and accessible ECG is invaluable. It can have lifesaving implications, especially for young athletes, who often are not aware of a cardiac precondition, and at their age, do not think of the possible dangers of strenuous physical activity in reference to the heart.